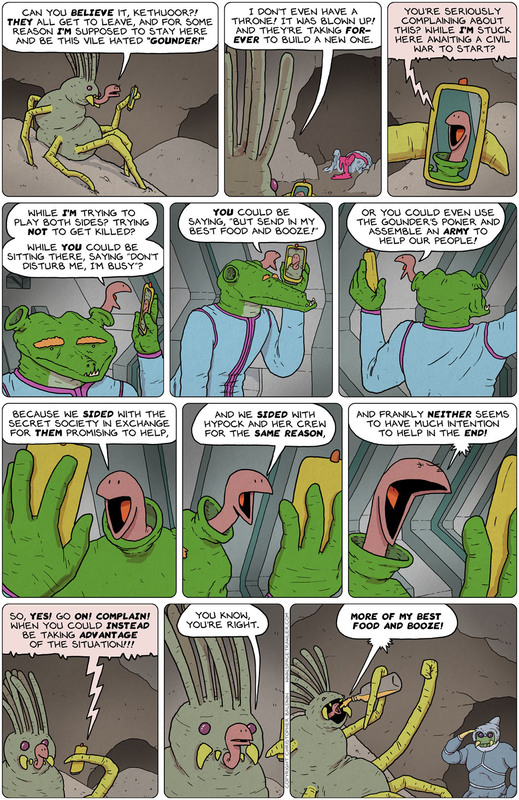 There’s something simple and with-a-feeling-of-closure about the final strips of each “chapter” or Spacetrawler, that for some reason I felt VERY reluctant to split it in two, and so I didn’t (although, in NO way view this as a trend, I think I like the half-strips as much as you all seem to) (and tomorrow there WILL be a comic, just a silly non-canon thing). Part 3-of-3 starts next week! Ah the problems of power and taking sides and expecting those sides to come through. An interesting discussion we have here. Then we get to the brass tacks! How do you untangle a Gordian knot when you make up part of it? Can’t wait to see the outcome. Keeper rolling! How to untangle? With a very sharp sword and a cauterizing iron. I very much prefer having new content four times a week over twice, even with the total amount of material being the same. I suppose I could only read half every day … but I suppose I could just not eat the whole box of chocolates at once too. Doesn’t happen, but I *could*. Since each Bag o’ Snakes character is made of many snakes, does the food and drink one gets feed them all? Or are these characters something we need to suspend any understanding of and simply get a kick out of them? Don’t complain about your position unless you want it to be an ex-position. Wow. That’s a very original presentation of “talking head” exposition! I’m beginning to see why Laufian slinten pods are scarce. And about to become even scarcer. Almighty scarce. TheWreck you did see where I mentioned that some of the good guys are now part of that knot so if you cut the knot you cut them? Sorry, not so easy now is it?